With games starting in less than two weeks now, we’re tipping off our 2018-19 Big 12 coverage by going around the league team-by-team. Be sure to check in throughout the season and follow Big 12 correspondent Brian Goodman on Twitter @BSGoodman. 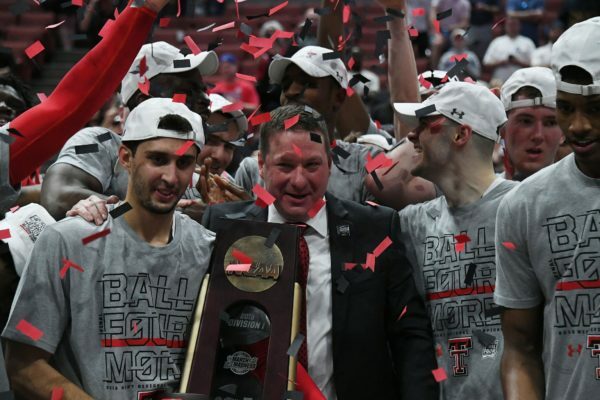 The Red Raiders were one of college basketball’s best stories last year, riding a deep and talented rotation to a 27-10 finish (11-7 Big 12) and the first Elite Eight appearance in program history. 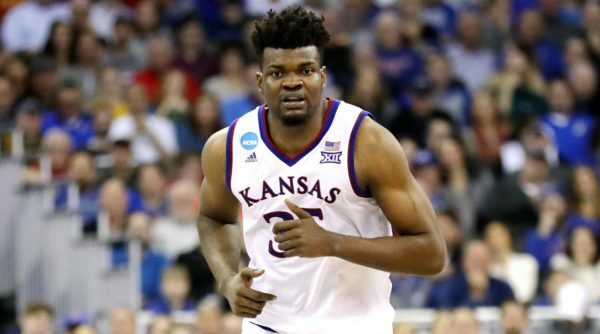 It’s still incredibly fun to think about what might have been had senior star Keenan Evans not been saddled with a broken toe down the stretch, but even so, this team was wildly successful in coming out of the woodwork to hang with Kansas for most of the conference season and make such a deep run in March. It also served to establish second-year head coach Chris Beard as one of the hottest names in coaching. Outlook: Beard may have lost his three of his best players from last season (Evans and Zhaire and Zach Smith), but there’s still a lot to like about this roster even if a league title is too much to ask. 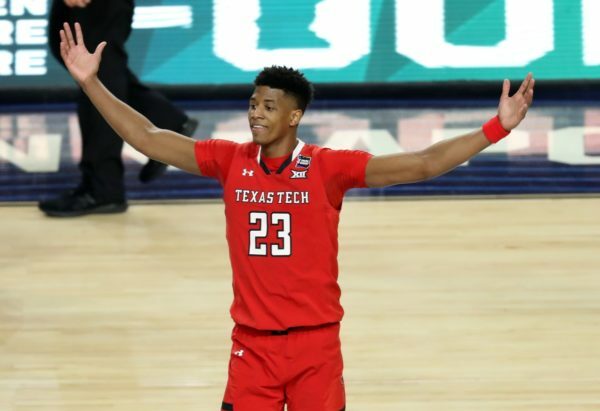 Jarrett Culver is a legitimate breakout candidate who is capable of scoring in a number of ways, and will be flanked by by floor-spacers in Matt Mooney, and Brandone Francis. Tariq Owens steps into the middle just one season removed from leading the Big East in blocked shots, and Deshawn Corprew’s rebounding ability on a 6’5” frame makes him an ideal small-ball four. 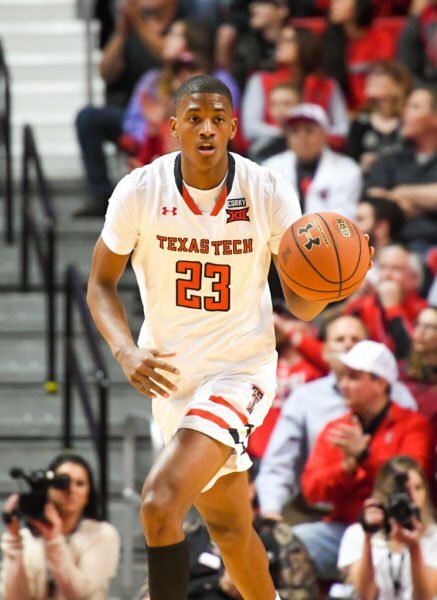 A relative lack of depth is something the Red Raiders didn’t have to worry about in 2017-18, but it’s more likely to crop up this year. Still, expect this team to remain competitive. The Big 12 coaches somehow picked this group to finish seventh, but don’t make the same mistake. Has St. John’s Figured Out an Offense? Make no mistake about it, the St. John’s offense is average at best. Its 1.06 points per possession (160th nationally) showing is propped up by decent free throw shooting and a remarkably low turnover rate, but nothing else from three-point shooting to scoring inside to rebounding, is commensurate with the team’s preseason expectations. So while the Red Storm’s stout interior defense and the scoring antics of sophomore guard Shamorie Ponds (20.3 PPG) have kept St. John’s competitive, an 0-11 Big East record tells the full story of its shortcomings. Coming off a string of four paltry offensive performances in which the team averaged 0.88 points per possession, expectations were understandably low when Duke arrived in New York City on Saturday. Yet, despite a 10 percent implied win probability (per KenPom) and a projected scoring output of 73 points, Chris Mullin‘s group at one point commanded an 11-point second half lead on its way to 81 points and a four-point win. All told, St. John’s hung 1.19 points per possession on the Blue Devils, its second-best effort of the season. 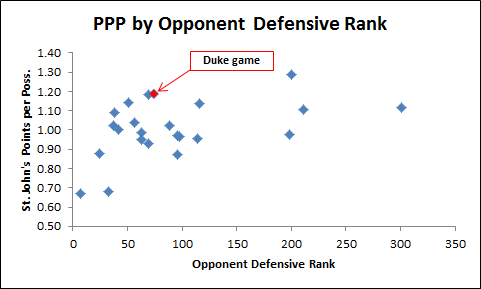 Yes, Duke’s defense leaves much to be desired, but it grades out at similar levels as Xavier, Creighton and Georgetown, all of which the Red Storm struggled against (averaging 0.98 PPP). So, what changed? Was Saturday’s performance a fluke or did St. John’s flip a switch on the offensive end? The answer is probably a mixture of both. 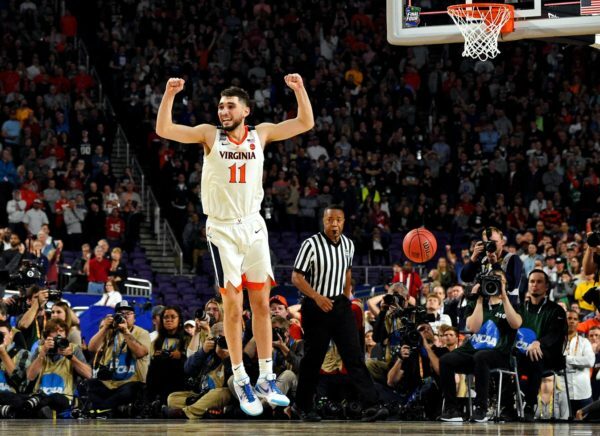 For one thing, while a 33-point scoring outburst from Ponds has happened numerous times this season, a more-than-50 percent variance from his average cannot be consistently counted upon. Second, a 47.1 percent outside shooting performance from a team that has connected on just 32.7 percent of its three-pointers is unlikely to be replicated. Looking at game film, however, shows that St. John’s found continued success in pick-and-roll sets. 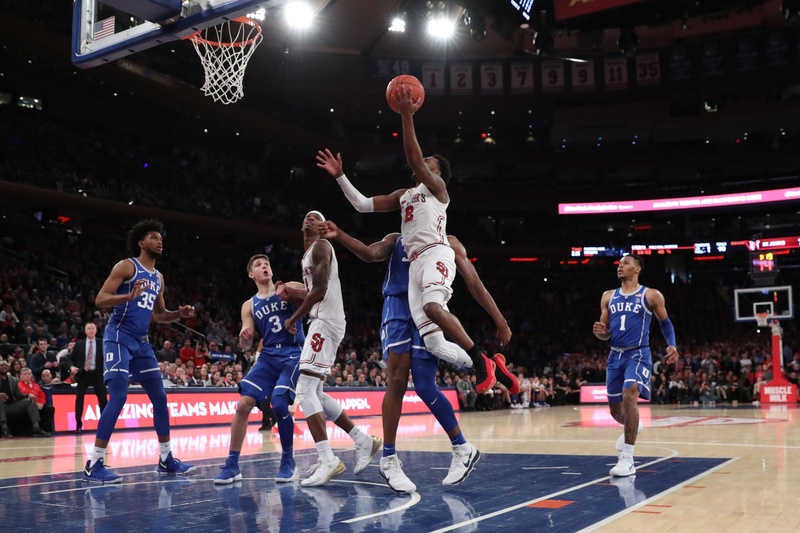 Those sets are the reason Ponds seemingly got to the rim at will, why Justin Simon notched seven assists, and why junior forward Tariq Owens accumulated 17 points. The SEC microsite will preview each of the league teams over the next week, continuing today with Tennessee. Strengths. This is a team that returns four players and only one starter from last year’s Sweet Sixteen run. That roster upheaval was created when head coach Cuonzo Martin left in mid-April for California. He was replaced by Southern Mississippi head coach Donnie Tyndall, and before Tyndall coaches his first game in Knoxville, he has already landed on the hot seat for alleged improprieties that occurred at his former school. The Volunteers will need to set those issues aside and focus on what they can control this season. 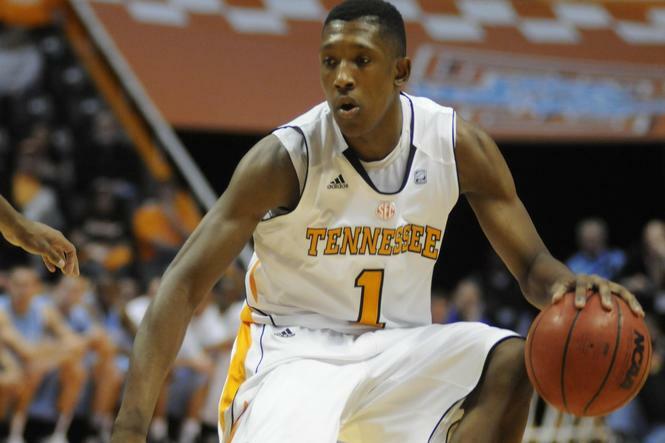 Their clear leader is Josh Richardson, a senior forward who came on strong during the NCAA Tournament run, averaging 19.3 PPG in four games after averaging just under 10 PPG in the regular season. Richardson had always been a defensive specialist, so his surprising offensive output encourages the team that the trend could carry over into this season. 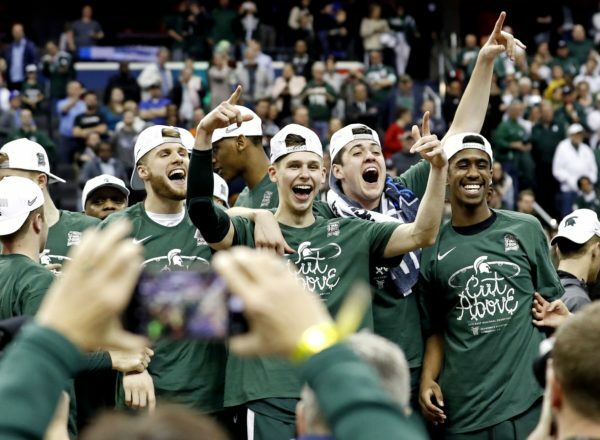 The senior is surrounded by good athletes, but the group has spent so little time playing together that it will take time for the team to develop any real chemistry. Weaknesses. There are many potential downfalls with these Volunteers, but the biggest may be at the point guard position. This is evidenced by Tyndall’s decision to play Richardson there. Ian Chiles, a senior transfer from IUPUI, was thought to be the solution when he joined the team, but he appears to be struggling to adapt. Kevin Punter, a talented junior college transfer who should provide some scoring punch, does not appear to be well-suited for the position either. Tyndall will need Richardson to capably handle the quarterbacking duties, and his team will need to force turnovers from the press to overcome this deficiency. In addition to the glaring issue at the point, the Volunteers appear to be very thin, both literally and figuratively, on the inside. Memphis transfer Dominic Woodson is eligible to play immediately, but even though he was a big disappointment with the Tigers, he provides some much-needed bulk in the paint. Still, despite the fact that he appears to have responded well to Tyndall’s coaching, he does not appear ready to play big minutes, and freshmen Willie Carmichael, who originally signed with Southern Miss, and Tariq Owens, who was set to go to Ohio, will need to overachieve.